2018.10.29 - BELIRIS has published a contract notice for the appointment of a designer for the redevelopment of the public spaces in the area around the Biestebroeck Dock. Selected in 2013 as one of the six pilot sites of the Canal Plan, the Biestebroeck Dock area is undergoing a profound transformation with the creation of new housing and the establishment of businesses. 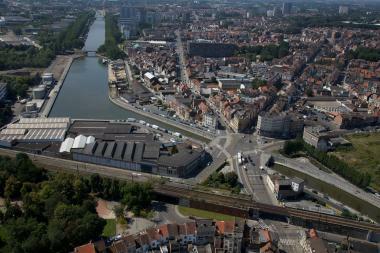 The urban plan for this area is part of a new Specific Land Use Plan (PPAS) developed by the municipality of Anderlecht and approved on 7 December 2017 by the Brussels-Capital Region. Construction could potentially take place on about 600,000 m² of land, with numerous public and private projects under development or even, in some cases, already at the building stage. The redevelopment of public spaces is crucial in this context to the creation of an attractive environment for this new mixed-function neighbourhood. BELIRIS is looking for a multidisciplinary team with the following specialisations: a public space designer, a transport expert, a construction engineer and an expert in citizen participation. The budget available for the preliminary studies and construction work is 4,817,520 euros including VAT for the first phase. The deadline for the receipt of applications is 23 November 2018 at 11.00.